Ever saw something weird enough, that would bump you off your chair? 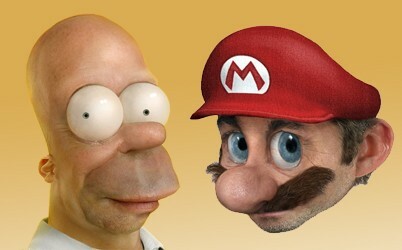 Here’s something we got for you: the de-tooned version of Homer Simpson and icononic game character Mario (who eventually changed his job from carpenting to plumbing). Actually, these are not exactly real life versions. An anonymous blogger at pixeloo de-tooned these characters in the form of 3D images which would look like if they retained their toon proportions but had realistic texturing and lighting. Thus, they got realistic-looking facial characteristics and complexions. All kudos to creater of these images. It takes some serious skills to create stuff like this. One can say that both of them look pretty old and worn-out in their de-tooned version. Probably, they were trying to hide their age by staying in their tooned version. Let’s see whether eveyone’s favorite G-rated hero ‘mario’ or America’s most admired daddy ‘Homer’ would flaunt these avatars in their upcoming game or movie. Nintendo and Fox entertainment listening?? we’ll have to wait for that.